(NewsUSA) - Forget low-carb diets and Atkins; those sweet, succulent spuds are once again finding their place among meat and vegetables at the dinner table. To celebrate its return to center stage, Kita Roberta of Girl Carnivore is recognizing the health benefits of a plant-based diet, while still including your favorite proteins. 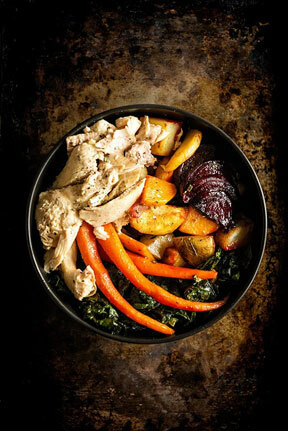 To that end, Girl Carnivore has created a recipe that is packed with carrots, beets, kale and Idaho potatoes. Add the sweetness of maple aioli and you've got yourself a good-for-you meal. Preheat the oven to 425 degreeF. Line a baking sheet with foil and spray with cooking spray. Toss all of the vegetables in olive oil and sprinkle with salt and pepper. Arrange the vegetables in a single layer on the baking sheet. Sprinkle with thyme. Roast in the oven for 25-30 minutes, until golden and fork-tender, flipping once, halfway through. Meanwhile, heat the remaining olive oil in a skillet over medium-heat. Sauté the Swiss chard with the chopped garlic until wilted, about 10 minutes. Season with salt and pepper to taste. Whisk the mayonnaise with the maple syrup and cinnamon until combined. Spoon into a serving dish. Divide the chard evenly in serving bowls. Top with the roasted vegetables and chopped rotisserie chicken. Serve with the maple aioli on the side for dipping. Idaho Potato Commission's website at https://idahopotato.com.